I'm joining Theta Mom Thursday this month! Head over to Theta Mom's blog to leave your link if you'd like to participate too. It's hosted by Theta Mom (obviously!) and is a time once a month where moms blog about an hour that they found during the month to spend on themselves without the kiddos. Good food and drink - and great company, what's better than that??? Thanks so much for linkking up and sharing! I LOVE LOVE applebees! They have fantastic drinks. I haven't been there awhile. That is sweet. No problem! 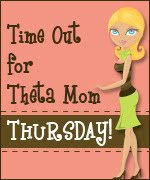 :) I love Theta Mom Thursday! They sure do! I hadn't been there in awhile either. I will have to read your post tonight after the kiddos go to bed! Oh my goodness, on top of a fabulous dinner with your hubbs you also got an uninterrupted shower ! Thats a little piece of heaven! Sounds like you had a great time out! 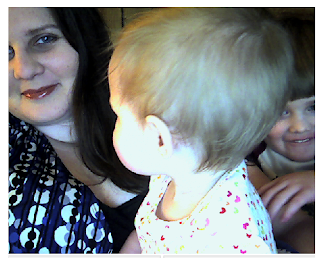 Theta mom sent me over to you, I love it and think I will stay a while.Following you now! Oh yes, showers without a little man driving cars on my feet or anyone screaming are wonderful - and it was a very lovely night out! what to make for valentine dinner i have to cook for my mom and sept dad and boyfriend and my little brother what should i make ?? Its a few days, but this is what I wore to my families dinner on Valentines. I don't usually do a lot of complicated eye make-up, but something about Valentines inspired me.